If looking at social activism from the peripheries, one is often led to wonder how the social initiatives become a reality from the inklings of ideas they have stemmed from, and after making seemingly grandiose claims such as ‘bringing about systemic change’, in fact begin to gradually emulate them. FundAction, as a participatory grantmaking platform emerged similarly as an idea from conversations between activists and funders, with the aim to shift the power dynamics to the forefront and confront the challenges of grant making and dissemination together. After having established a footing with the first rounds of grants at the close of the previous year, with the first annual FundAction Assembly being held from 6th to 8th April in France, it seemed that FundAction was entering the very stage where an initiative goes beyond its rudimentary structure towards bringing about meaningful change. 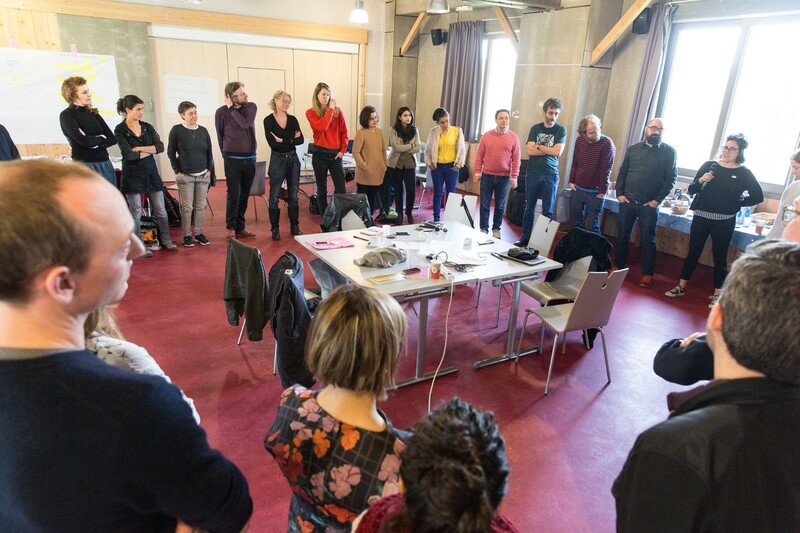 The FundAction Annual Assembly brought together 45 of the currently standing 164 member community, with activists working on a diverse set of initiatives from the Commons Movement, to Feminism, Sustainability and the New Economy. During the Welcome Session of the event, Marta Vallejo, facilitating member from ZEMOS98 expressed, “We are all active citizens, and we carry the issues of the communities we represent, our own and also the world that we see around us.” While each member added distinctively to the identity of FundAction, the assembly also presented the gargantuan task of bringing this diverse set of people on the same page. The FG attempted to do so, not only by informing of the basics of the platform, but perhaps most importantly by reiterating the broader collective challenges faced that bring everyone together and form FundAction as a community of activists and members of the European and global community and necessitate the causes it aims to support. In the case of FundAction, its structure as a participatory grantmaking initiative itself is one of the aspects that confers it with transformative potential, thus the event was crucial in involving everyone in the intricacies of the framework, also considering the upcoming FG Renewal. Moreover, as Laura Roth, one of the former FG members conveyed, the ultimate goal was to leave the major decision-making to the community itself, which made this information an essential prerequisite for community involvement. Therefore, the general framework and specific tools that would allow for and encourage community involvement were also discussed such as online assemblies for elections or additional features in the online platform. In the audio-visual source code session members reflected on what participation meant for them using a video clip, song or recipe they were asked to submit. Mercè Moreno Tarrés showed a clip that elucidated that “It is not always about results, but participation is about the process.” Zsuzsi Pósfai played a documentary clip and explained that participation for her was about getting involved, “You can not pretend to save someone without putting yourself in the middle of the conflict and difficulty yourself.” Moreover, Hunor Király explained that for him participation meant “Getting very different people together, and start talking.” He said that social initiatives often bring together people and foster otherwise unlikely connections, allowing for unique ideas and partnerships to emerge. The assembly also seemed to parallel this reflection, where the burgeoning potential of the often elusive foundational phase unravelled into a collection of powerful conversations, with each interaction and connection building on one another to create a sense of community and purpose. A look back at FundAction Annual Assembly 2018 was written by Ghada Nabi, reporter of FundAction’s Annual Assembly. Click here to read the whole report of the Annual Assembly.